My current work is mainly thrown. 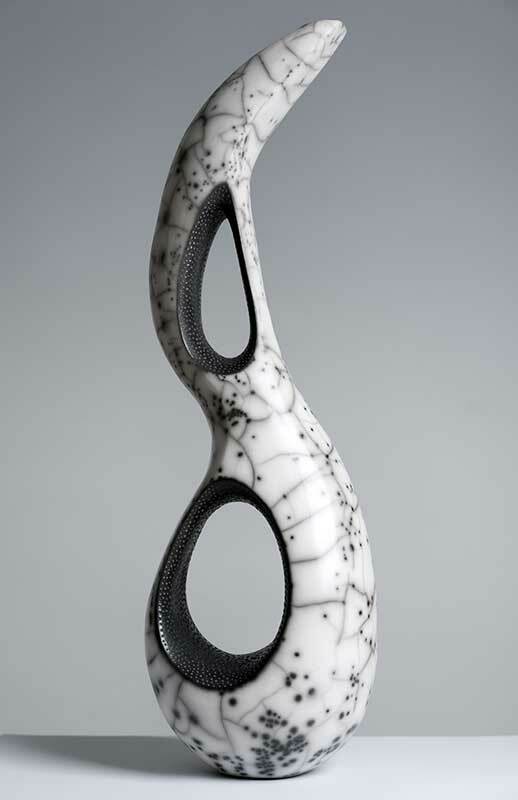 I continue to focus on the vessel form, working in series and making one-off pieces. I find my inspiration in natural and urban landscapes, as well as the seemingly random and mundane – pebbles on a beach, rusty metal tools, peeling layers of paint, found objects that suggest a fragment of a story- and it’s also these things which inform my colour palette. I work primarily with porcelain as, despite its tricky nature, it has the right qualities for the finishes I want to achieve and explore. The surfaces of my vessels are important to me, I use them as a way to express a narrative and achieve a patina of depth and variety. 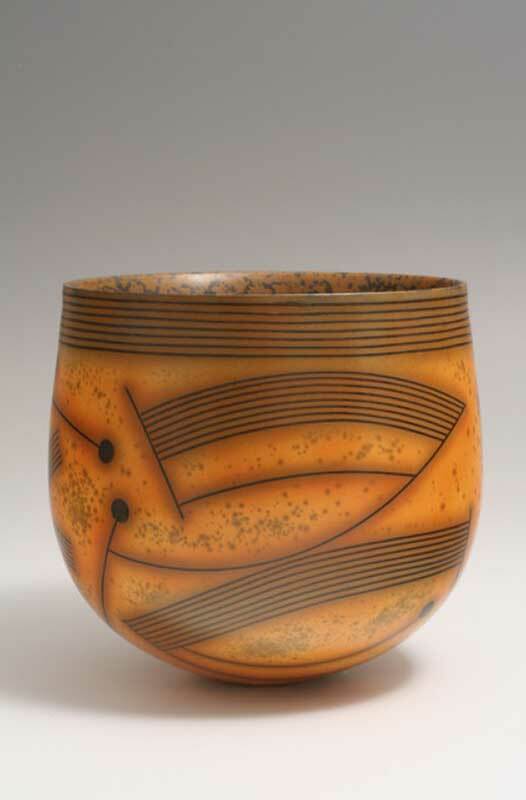 The vessels are layered with oxides and glazes, brushed and dipped, and often multi-fired. They are used as a canvas to investigate the myriad combinations of texture and colour. 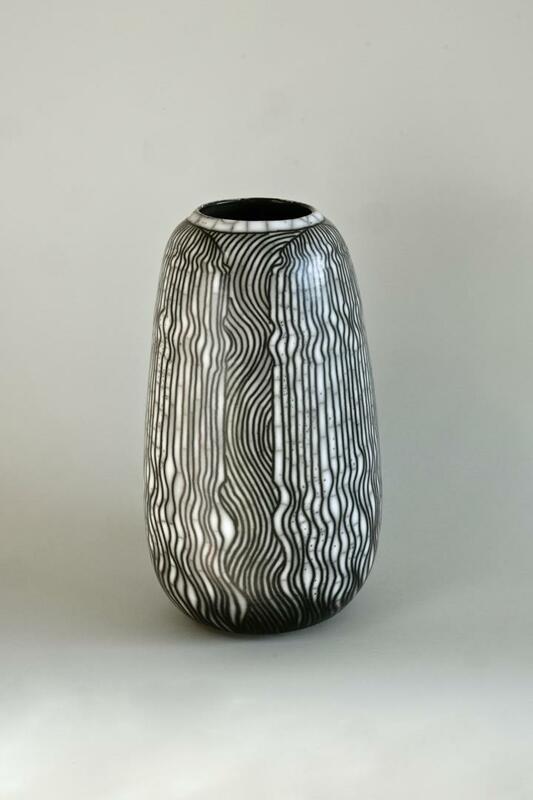 Petra Reynolds trained in the South East and then on degree at Cardiff before joining Wobage Workshops, South Herefordshire in 1995. She and her husband, Jeremy Steward, also a potter, live on the edge of the Royal Forest of Dean. They were invited to join the Wobage studios as part-time apprentices to Mick and Sheila Casson, a role they maintained until Mick’s death in 2003. The construction for Petra’s innovative slab-building techniques begins with one of many paper templates. 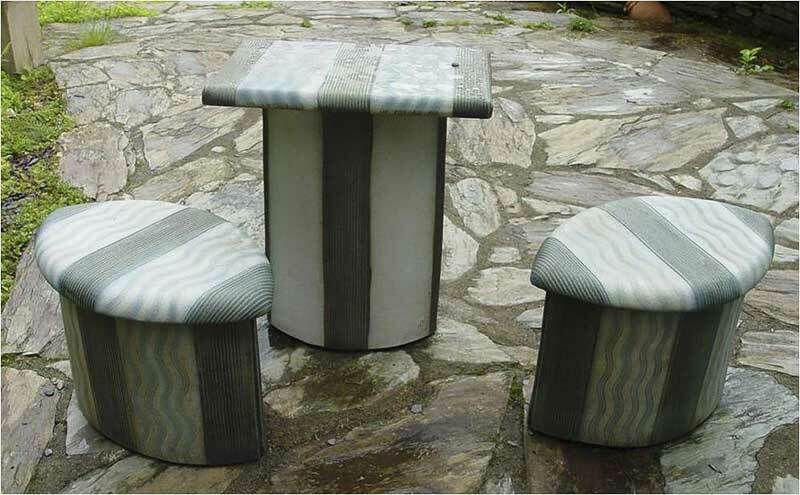 Clay slabs are then cut around, mitred, bent and folded into a range of domestic shapes. The simplest forms are often single slabs whilst the likes of teapots and butter-dishes are built and assembled from multiple components. The inspiration for her decoration is many fold. From playful experimentation with line, pattern and composition, sketches evolve firstly on paper into monochrome or colour monoprint and collagraph. 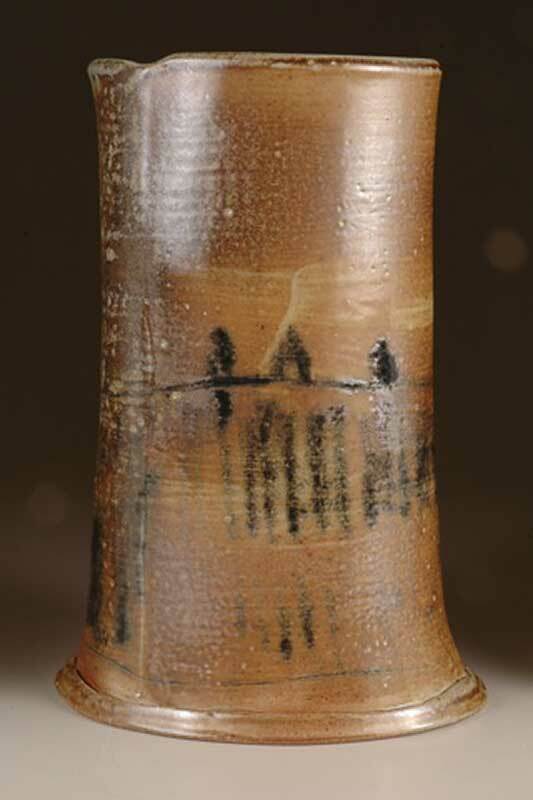 Decoration on pots takes place at the leather hard stage using salt-slips and raw-glazes. Initially slips are layered with brushwork, pouring and paper resist. This provides canvas for a more linear decoration which is achieved by a form of printmaking. Motifs are drawn from an array of different objects and observations bringing to life a new and ever-changing vocabulary of marks and compositions. 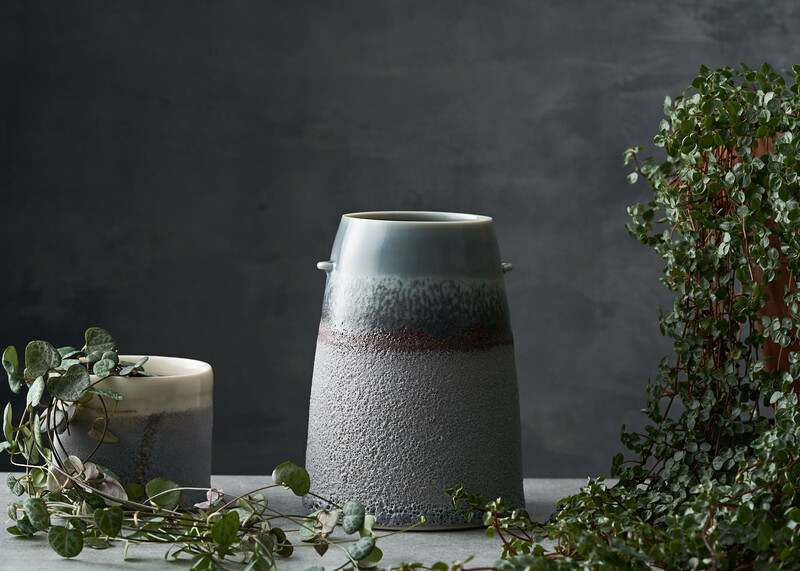 The pots are once-fired to 1300C with salt & soda in a wood-fired kiln. 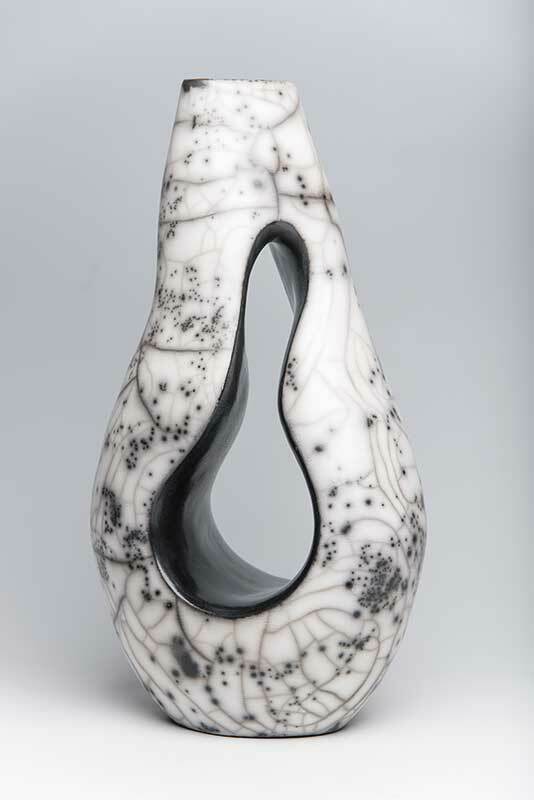 Having trained at Harrow School of Art under Mick Casson, Christine-Ann’s interest in thrown porcelain led her to work for David Leach before founding her first workshop in London in 1975, where she specialised in monochrome and crackle glazes. 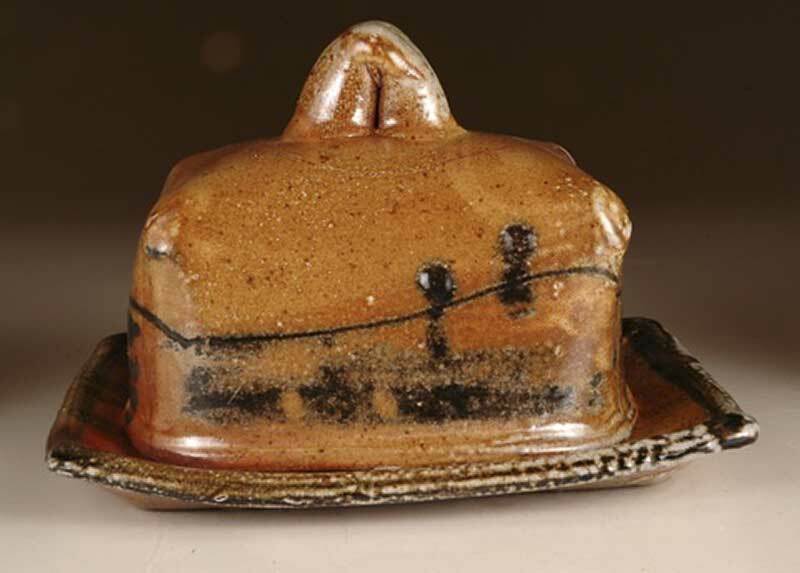 The 1978 CPA trip to China consolidated the influence of the East on her ceramics, and continued visits, sometimes accompanied by other artists, have carried on that exchange. Her growing interest in Chinese calligraphy and painting led her to consider, for the first time, her ceramics as canvases – copper-red and green splash decoration giving way to a more calligraphic vision of black and white pots with a splash of red enamel. 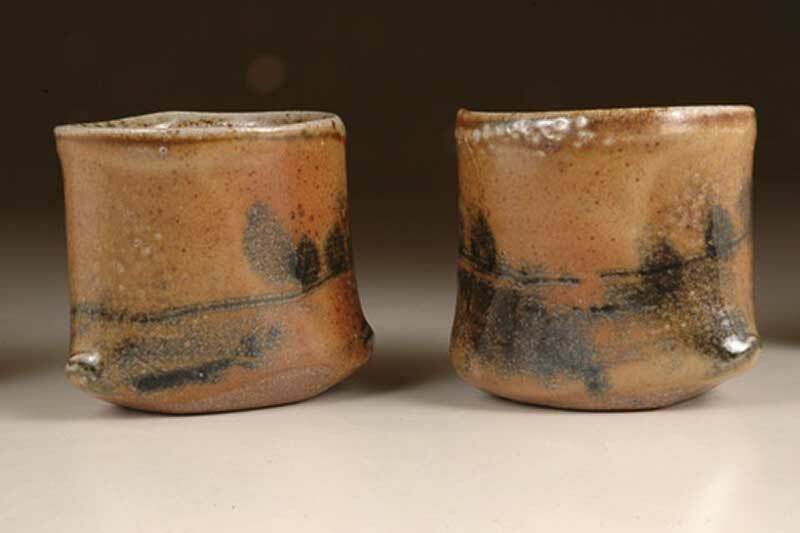 A Winston Churchill Travelling Fellowship to Japan in 1996 to ‘look at the way water is used in landscape and architecture’ has been an ongoing source of inspiration for her larger hand-built garden ceramics. 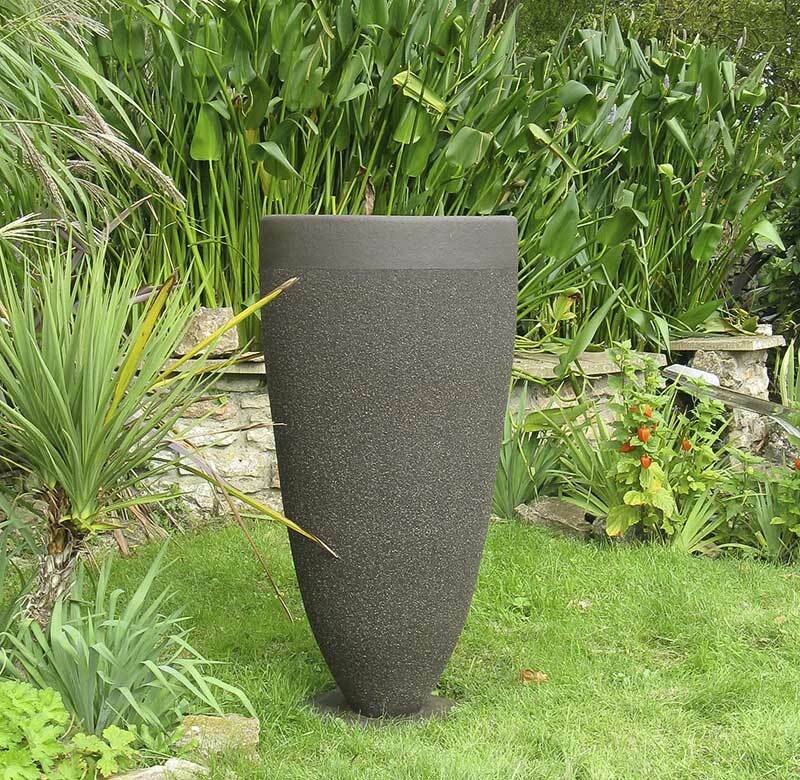 Since graduating from the University of Westminster, Harrow, in 2006, Lesley Risby has worked from her home in Harrow. Her inspiration comes from the natural world. 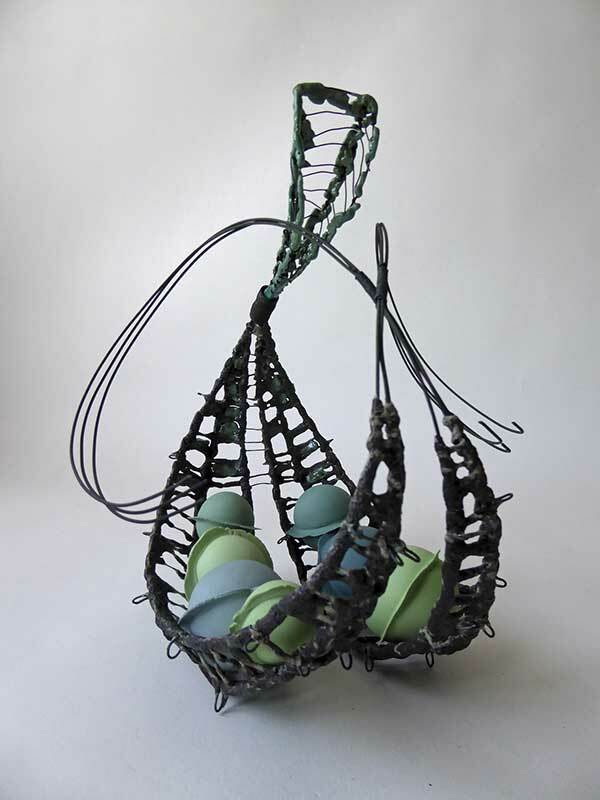 She makes organic sculptures, from multiple pieces, assembled to produce a cohesive whole. They are composed of delicate porcelain forms, which are supported within a porcelain-coated nichrome wire armature. Some have additions of Egyptian paste, providing extra colour. The disparate quality of the materials creates a visual as well as a physical tension in the work and they have a feeling of lightness and movement in space. 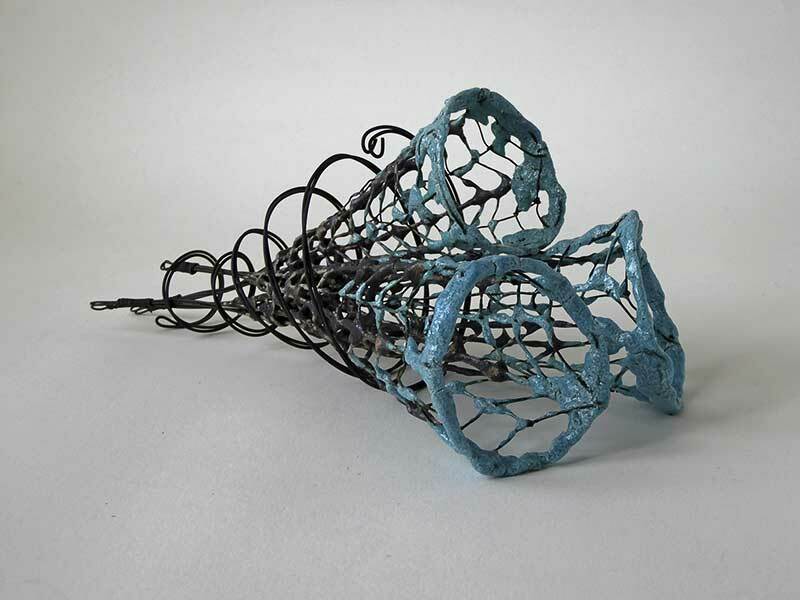 The skeletal quality of the forms alludes to the essence of nature’s fragility and vulnerability. The work is hand built. 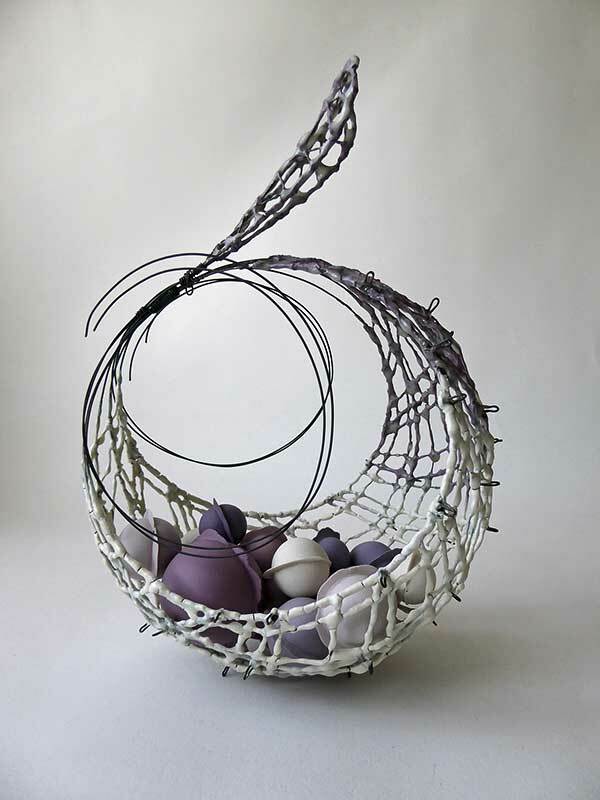 The porcelain and glaze coated wire armature is fired once to 1250οC, while the porcelain forms are bisque fired (1000oC) and then smoothed with “wet & dry”, before firing to 1250oC. An additional firing to 1000oC is required for the wire pieces which have Egyptian paste added. 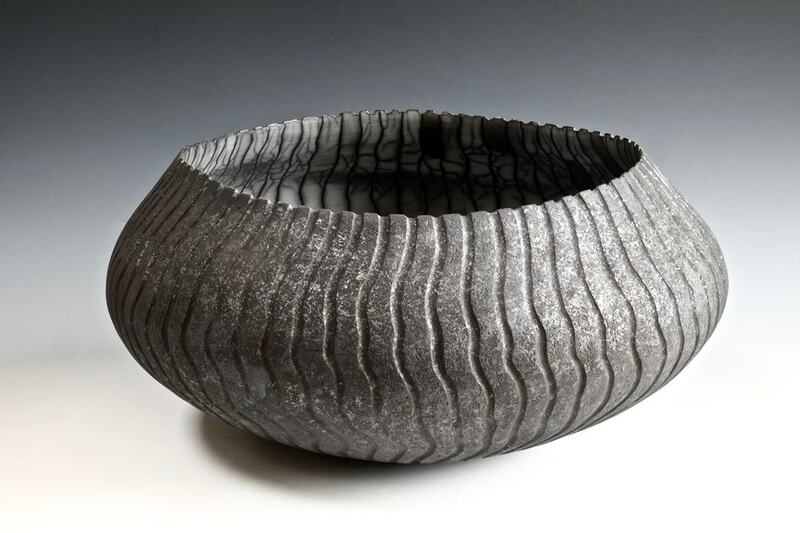 David Roberts is oe of the first UK potters to focus on high quality raku ceramics. 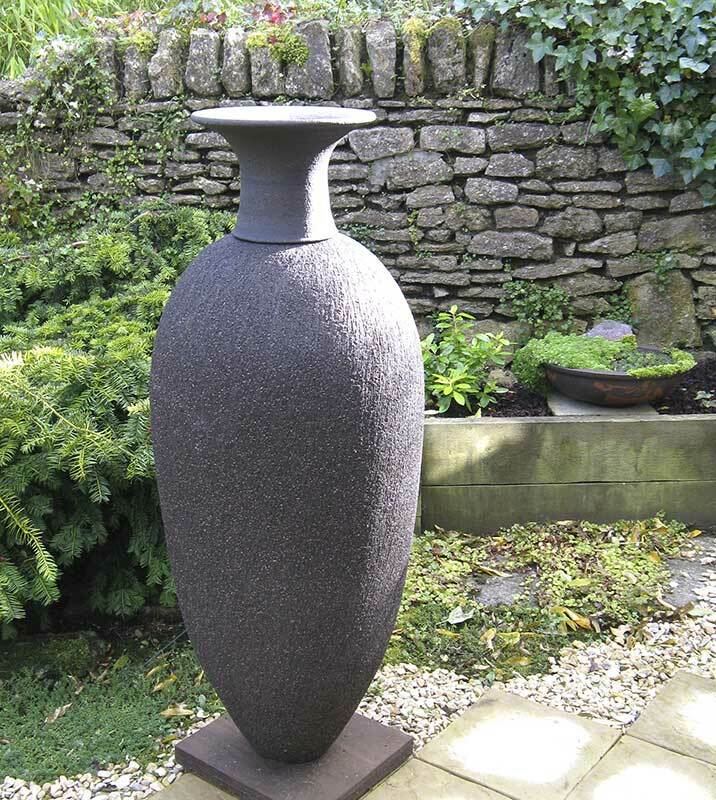 Over the past 40 years has established an international reputation for large, hand built, raku fired vessels. Work in public collections throughout the UK and Internationally. 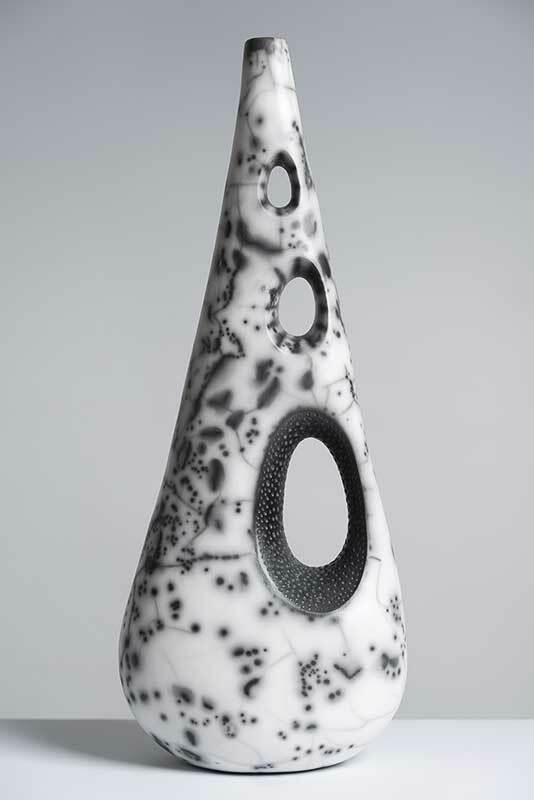 David is a member of the International Academy of Ceramics, Fellow of the CPA and Full Member of Contemporary Applied Ceramics. Born and educated in the USA (Missouri, Iowa and Michigan). 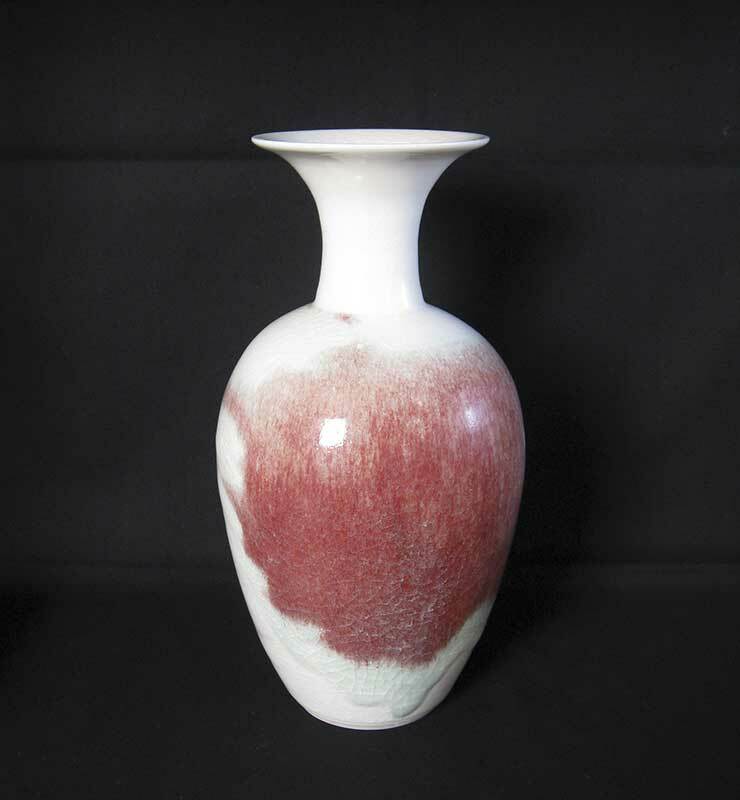 Moved to Yorkshire, England in 1972, established the Booth House Gallery and Ceramics Studio in Holmfirth 1975. 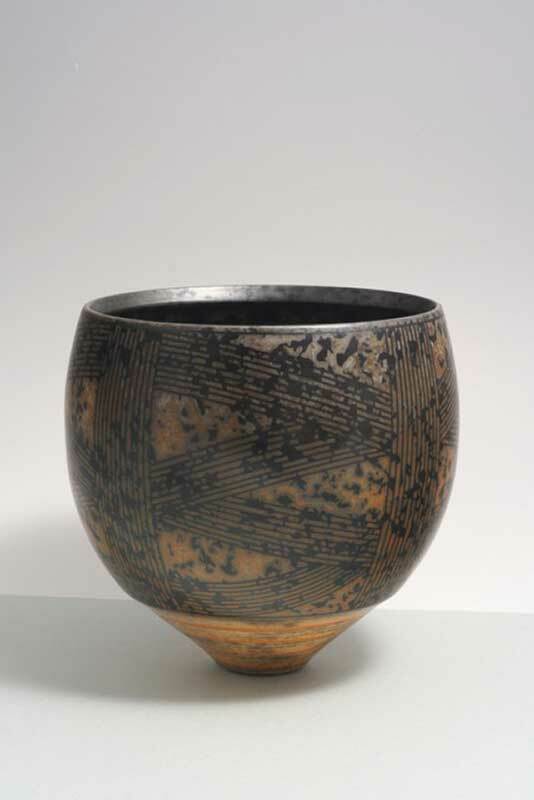 The gallery specialises in ceramics with a focus on his studio practice. Work is usually slab built and slip decorated, often working to commission, including large-scale sculpture and architectural ceramics, Jim enjoys an experimental approach to making, combining personal construction techniques with unusual surface textures created through multiple layers of clay and colourful glazes. All pieces are stoneware, reduction fired in a gas kiln. 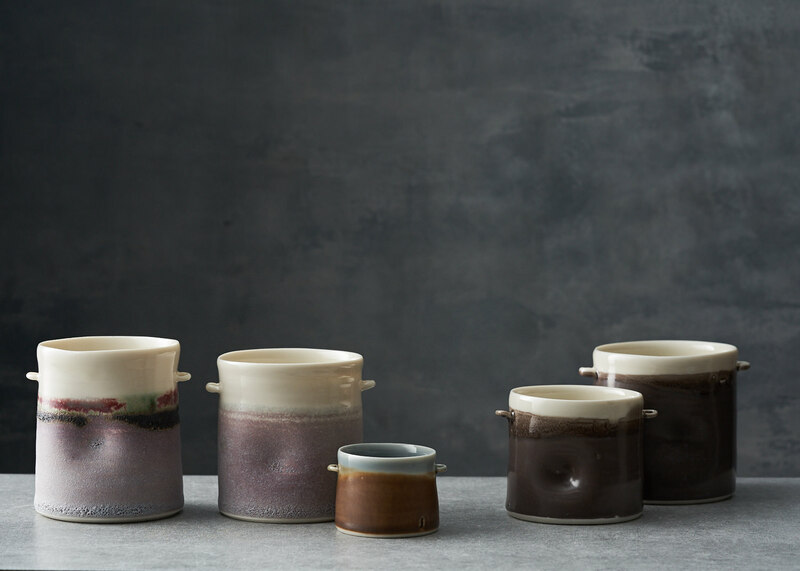 He is often asked to speak and demonstrate to ceramics groups throughout the UK, and abroad (including American NCECA Conferences, the Wales International Ceramics Festival, Irish, European, Canadian and Australian events ). Residential courses are offered at his studio in making, glazing, and extrusion techniques. 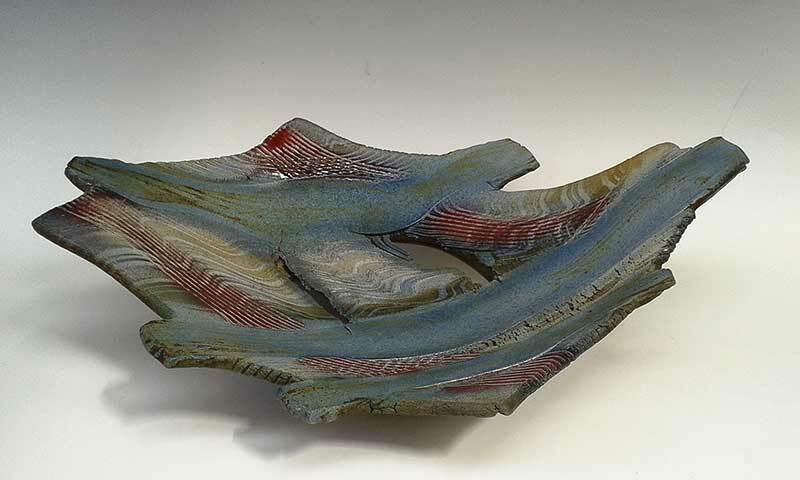 His English wife, Liz is an author who has written under the title of a ‘Potter’s Moll’ for the Craft Potters and Northern Potters Associations. 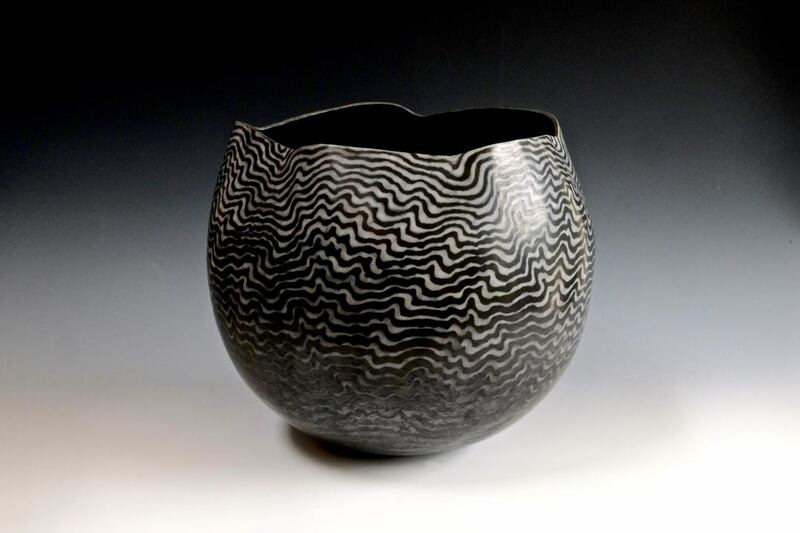 All Helen’s work is handbuilt by coiling and pinching, finishing by lightly burnishing and adding a textural pattern to some areas. 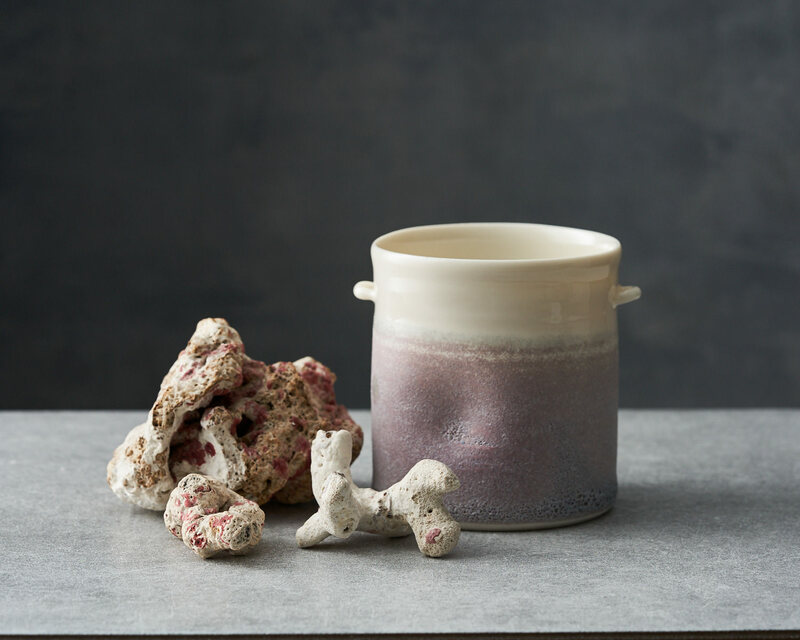 Earthstone smooth clay is used and is bisque fired in an electric kiln, the pieces are then covered in a resist slip and a crackle glaze and fired in a ‘Top Hat’ Raku kiln. After firing the glaze falls off the pieces to reveal the smoked patterns underneath, they are then cleaned and waxed to protect the unglazed surface. 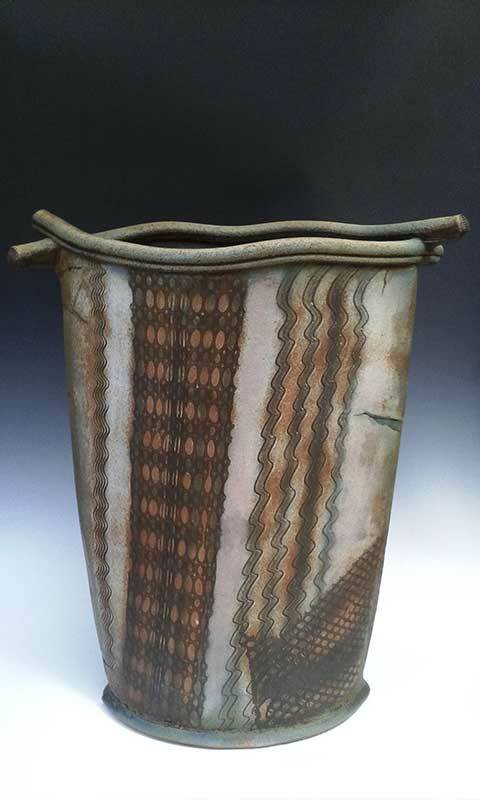 My work is thrown and burnished using many layers of a fine terra-sigillata slip with resist and inlay decoration. I began working with sigillata to develop a rich surface with a combination of form and pattern that would be integral to the clay. Starting with line and dense burnishing, I experimented to obtain a feeling of depth, allowing the carbon process to play its essential and unpredictable part. I am searching for development that comes from themes and variations; allowing the ideas to flow from one group of work to the next, adding and omitting to arrive at a natural relationship of surface to form. The challenge lies in the relationship of form and pattern. Balance, rhythm and proportion are all important. It is the combination of the fundamental and the sophisticated that I find fascinating. 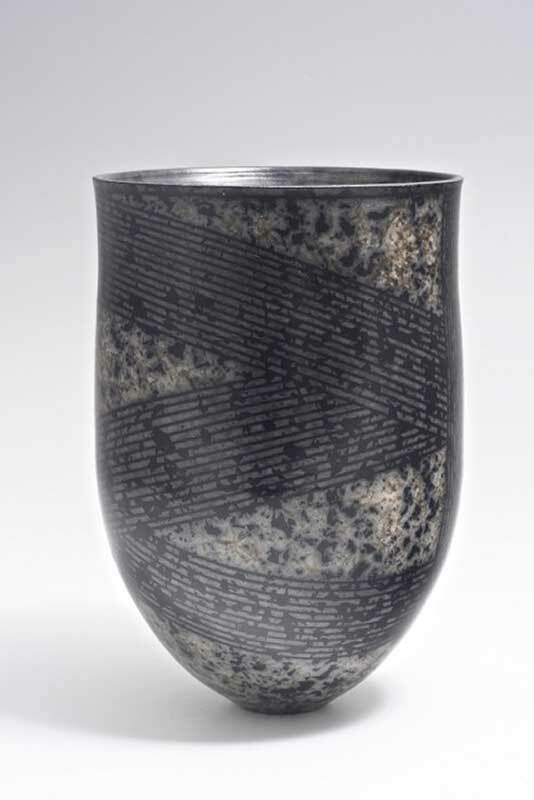 My vessel forms are represented in the collections of the Victoria and Albert and Fitzwilliam Museums and the Walker Art Gallery among many others in the UK as well as notable collections abroad.